Cashmere was once the preserve of the wealthy as garments fashioned from this most luxurious of yarns were too costly for the average consumer. Things changed back in the 1990’s when cashmere began to enter the mainstream. Big brands and high street retailers began to feature cashmere garments in their collections at more affordable prices but this new trend partnered by the current thirst for luxury goods is rapidly becoming a major problem. The world’s population is growing and the economies of countries like China and India, which have huge populations, are prospering. Partner all those people with a global demand for luxury goods and you need a big supply of cashmere, a supply which is now becoming unsustainable. 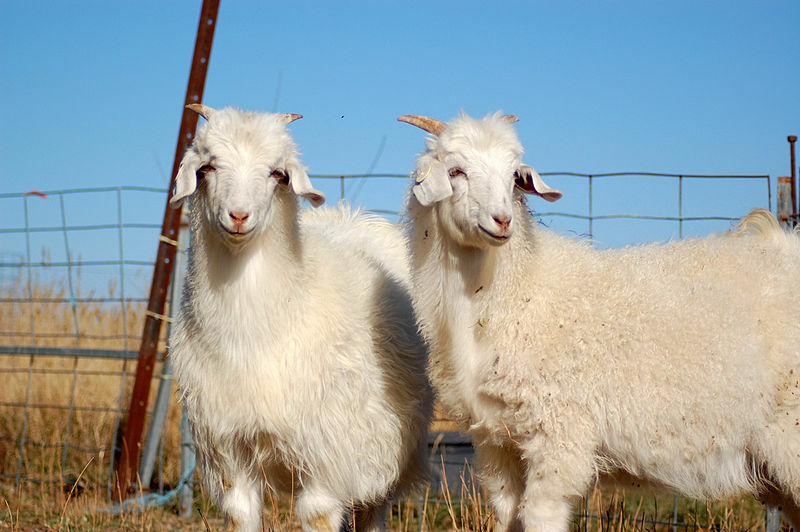 Cashmere is harvested from the coats of goats which live in the harsh conditions of the Mongolian Steppe, the mountains of Kashmir and Afghanistan and the Chinese tundra. It is the extreme conditions of these environments that promote the growth of the ultra-soft, insulating fibres that are in such demand. Goat herds have been expanded to keep up with demand but the goats are eating the vegetation at such an alarming rate in the grasslands that huge tracts of land in both China and Mongolia are at great risk of turning into dessert. As a result sand storms are already afflicting urban areas in China and the ecosystem is being damaged, threatening the environment and many endangered species. Climate change is also causing issues with cashmere production. Some regions where the goats graze have recently experienced exceptionally harsh winters which have decimated the herds, lowering yields and severely impacting the incomes of the farmers. Basically the current demand for cashmere is unsustainable in the long term and fashion houses and retailers are responding to the issue by turning to other luxury fibres like alpaca. Alpacas live in the less fragile environment of the Peruvian Andes. The highest grade alpaca fibres rival cashmere for softness, they are even more durable and one alpaca will produce as much yarn as four or more goats. The move towards alternative fibres is being reflected by changes at the Cashmere World trade fair which will take place once more in Hong Kong this year. The scope of the fair has been broadened to encompass other luxury fibres including alpaca, angora, vicuna, baby yak and chinchilla. Cashmere is not the only option and is often woven with other fibres to produce yarns. Leaders in the fashion industry are certainly aware of the issues associated with cashmere and are thankfully now looking to a more diverse range of fine fibres to fulfil the demand for luxurious garments and in order to offer more choice to the consumer. You can expect to see a changing fashion landscape over the coming years and this should benefit both the planet and the lives of those who work with the different species that are now falling under the spotlight. One can only hope that the same problems don’t emerge all over again. People do not need to stop wearing cashmere but they must accept that it cannot be a cheap and plentiful commodity. This entry was posted in Discussion, Fashion and tagged alpaca, cashmere, fashion, luxury fibre, luxury wool, wool. Bookmark the permalink.